'The Orchard 2013' is an oil on paper. 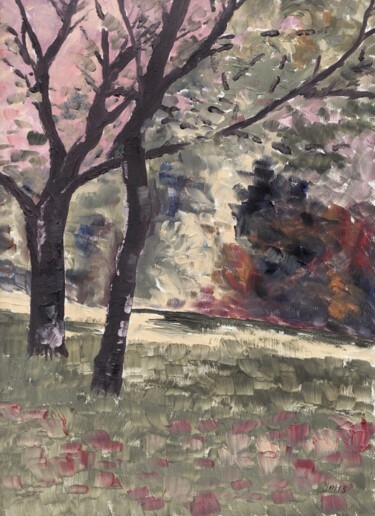 This is one of many studies of the orchard at home that I've undertaken over the years since the early 1990s. When we bought the cottage initially in the late 80s there were two old apple trees there. Unfortunately, the house had been idle for almost a decade and as such the trees were not great producers of fruit. However, they were great foundation-blocks for our children's development as they had great fun in the orchard learning so many things and even built a tree-house on a limb which hung right over the boreen at one stage. Over time we lost these two trees to age and decay; however, at that time we had planted many more fruit trees so the orchard lives on!! This painting is in a dark-waxed old ochre ornate wooden frame. A set of limited edition prints, signed and stamped by the artist, is available; email Mícheál for full details.